Do you still hate the seaport? View Poll Results: Do you still hate the seaport? Re: Do you still hate the seaport? The Seaport adds to what makes Boston such a great core city, it's a brand new neighborhood of residential, office, retail, restaurants bordered by a beautiful Harbor Walk, Fort Point Channel, and much older, traditional brick and mortar Fort Point itself. But cross the bridges over Fort Point and you got Boston itself, with the Financial District, Quincy Market, the North End, Beacon Hill, the Back Bay, the Sound End, the Fens, holy crap, what city has all this architectural diversity and urban street-level energy in such a concentrated area? I love the Seaport for it's shiny newness and harbor views as much as I love the older neighbors for their historical compact oldness, if that makes any sense! Given that the airport is right across the way and the Seaport will never see the benefits of height as long as it remains there (which is fine), it is an abject planning failure that they laid out tower-scale blocks for a place with no towers. If the conditions give you a low ceiling, plan for that scale. It’s nothing more than a corporate shitshow. Back bay, north & south end, beacon hill, Harvard, porter, union, Davis, Inman, Kendall squares? It’s a corporate tax shelter on priceless land that our politicians gave away for peanuts on the taxpayers hard work. Assembly square development is more unique than seaport development which is pathetic. If your not rich or part of the corporate culture then their is really no reason to go to the seaport. It’s cater to the rich not to the overall public. Last edited by TheRifleman; 08-09-2018 at 09:49 PM. The Seaport is coming along nicely. No one said it stands out over all those places lol. It doesnt need to be any of them because we already have them and theyre great and not going anywhere. Its a good thing that its different over here so theres a large variety of neighborhoods. If the back bay is your thing or your in that type of mood, go there. The people that like a modern style on the waterfront will enjoy it over here. Both can coexist in Boston. Its great to have diversity that makes cities great. The thing I like about the Seaport is that they are building half decent quality structures unlike the crap being built in most of the city. I was here with my girlfriend a few weeks ago and it seems like there are a lot more stores and restaurants beginning to open up. The whole place is beginning to feel more like a cohesive neighborhood and less like a spotty wasteland. I recommend those of you who haven't been here for a while to come check it out and take a walk around. It's not a perfect place by any means, but the arrow is pointing in the right direction and the breadth of the construction zone is truly impressive. I never hated the Seaport. 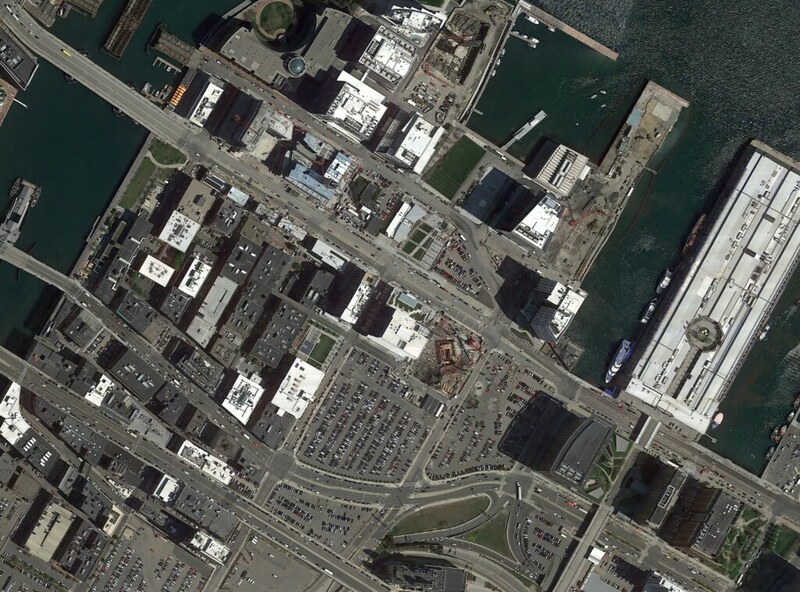 Interestingly, when this thread was started (in 2016), the Seaport looked like this. Currently, six of the projects U/C in that shot are completed, construction is currently ongoing on another five, and two more parcels have announced tenants/developers. Lots of progress. It would have been cool to have a couple of canals running through the development area.